Communications: Do you LIKE evangelism? Quotes: "I have been through some terrible things in my life, some of which actually happened." I pastor a metropolitan congregation which, along with three or four other churches, is a constituent of Adventist elementary and high schools, both on the same campus. Over the years I've faithfully attended school board meetings and taken my turn with the other pastors in the chapel-talk rotation, but I've always felt I should spend more time at the school. Problem. I'm not a jock. Basketball was never my thing, and four minutes of soccer - even if I knew how to play - would lay me up for a week. At the beginning of the year I send out a group e-mail to all the teachers, explaining that I want to be considered not a looming "pastoral presence" but just another parent volunteer. Each Sunday prior to a school week I send a group e-mail to the teachers, reminding them I'll be there Tuesday, and asking them to e-mail me with duties I can help with (first-come, first-served). Since sports are not my strong point, teachers have tended to ask me to grade assignments, essays or tests. I always insist on clear and understandable answer keys so I won't defraud the kids. And I always stand ready to perform more directly pastoral duties such as teaching baptismal classes and talking with students. Another task I'm asked to do is to listen to kids read to me. I give each kid ten minutes, and remain ready with a pencil in my hand so that I can point to a word and ask them to repeat it. A good portion of my time is spent trying to help them sound out the words. Did you know that English is by far the world's craziest language? For those Tuesdays I set clear ground rules for myself. I am always strictly on time, and I always arrive at a classroom exactly when I am expected. I always call the teachers by their last names, prefaced by "Mr.," "Mrs.," or "Miss." I carry with me a lot of large paper clips and post-it notes, and a supply of green gel pens (to distinguish my grading from the teacher's red marks). Since space is tight at the school, I will often grade papers in my car. These Tuesdays have deepened my love for kids and what they go through in the classroom. I've seen appalling handwriting - and I've seen budding genius. I'm also far more appreciative of the work that teachers do, and I am tremendously impressed by what they're teaching our children. When was the last time you "liked" something on Facebook? It probably was a cute picture, or a funny post of a friend. By clicking on the LIKE button, you are expressing your feelings and sharing it with your online friends. Social media has incredible power, of which most of us are only starting to recognize. Who would have ever thought that communication vehicles like Twitter and Facebook would contribute to the demise of a dictator ruled countries such as Tunisia or Egypt? How can Christians leverage this influential medium to share the life-changing story of Jesus? The average Facebook user has one hundred and thirty friends. Each one of those friends is influenced by the posts and pictures that they share with each other on the site. Every time you click on the LIKE button, you are encouraging your friends to consider your opinion on an idea. With your status updates; you are influencing what your friends see. Would you consider LIKING the posts that come through your Facebook feed from your church or church organization? It could be an e-newsletter link, photo album, or link to a ministry opportunity. When you click on the LIKE button, your friends will be witness to your activity, and have the opportunity to check out what you like. By clicking on the LIKE button, you are expressing your faith in Jesus and the church you attend. It's that simple! Your spiritual influence may be the contributing factor in helping your friends to discover the same love you have for Jesus and your church. Now that is something to LIKE! Rajkumar Dixit is a pastor, and the author of Branded Faith: Contextualizing the Gospel in a Post-Secular World. You can read more at rajkumardixit.com. Watch as the winner is chosen at random to receive the iPad 2 prize for participating in the Best Practices media poll. On March 9, 2011, the NAD Church Resource Center sent out an invitation to the Best Practices email list inviting subscribers to participate in a poll regarding the use of media in their congregation. As with any self selected poll the results only reflect the views of the 546 participants and do not reflect all of the pastors of the NAD. Those who participated indicated that satellite broadcasts as well as the division wide media ministries continue to provide some benefit to their congregations. In addition many churches are using media locally in their mission. Websites led the usage followed by Facebook and email newsletter. Click here to see the whole graph. 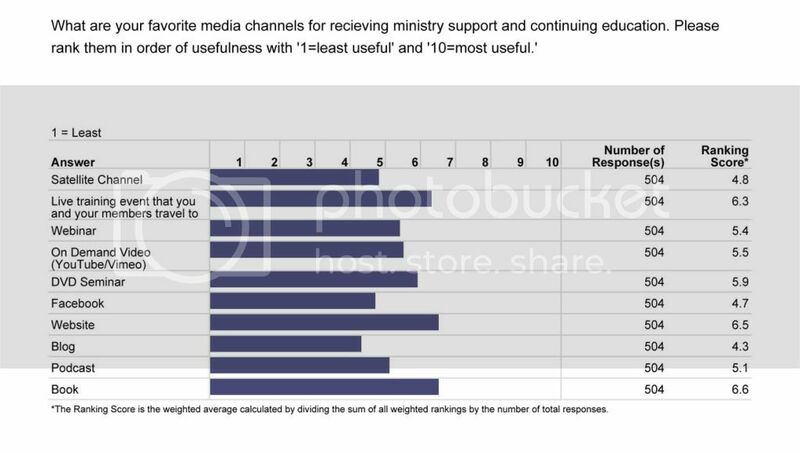 When asked 'what are your favorite media channels for receiving ministry support, the responses were fairly evenly divided between all of the channels. Books, websites and live training events were favored but other channels were close behind. Click here to see the graph. An open ended question was included for pastors to name a church that was using local media effectively. Future Best Practices will highlight some of those churches. Small group quality is more important than quantity, says Baylor professor. Quote: "What matters is that the groups meet regularly; that members trust one another enough to divulge matters they would not to a stranger; and that they tackle tough issues in one another's lives." Are you an innovator? Check yourself by the five habits of great innovators. Is the "virtual church" something real, or a gimmick? At least one pastor takes the online community seriously for evangelism. Quote: "A major argument against internet churches is that they lack physical contact, Estes pointed out. But that same argument could be made against megachurches and any other church, for that matter, where people never really touch or come to know each other." Forget broadcasting your services via cable TV. The next frontier is direct broadcast via Roku. Quote: "There's a burgeoning 'house church' movement in America, Making services available on Roku provides a way for individuals to gather together for worship in their homes that doesn't require huddling around a computer screen or complicated PC-to-TV hookups." I just don't get Twitter, but it's apparently very popular - even among some pastors who use it to bring attention to the gospel. Do you use Twitter? How? Six Biblical principles of worship - this would make a good sermon or seminar. New tools, new problems: Facebook linked to 20% of US divorces. Humor, with some seriousness, too: Ten things to give up for lent. 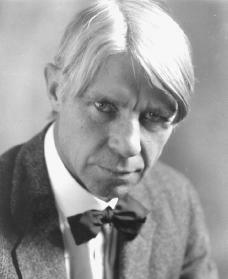 Quote: "The truth is that hating others has become one of the defining marks of the American Church. No funny one liners here. This has to stop. Just because someone in another tradition/denomination/church doesn't agree with you particular theological outlook doesn't make them a heretic. The Christian on Christian violence has to come to an end.... So if we are going to give up for Lent this year let us give up our hate for one another and never pick up it again." f you don't know what to do with many of the papers piled on your desk, stick a dozen colleagues' initials on 'em, and pass them along. When in doubt, route. Cuteness off the chart! Watch this little girl tell the story of Jonah. The very creative Tony Romeo, pastor in Greater NY Conference, has started an organization called REACH NYC. There's also a weekly newsletter by Tony about what RNY is doing-some of the most creative outreach ideas you'll ever come across. Get on the RNY mailing list here. Ohio Ministry University. March 19-20, 2011. Dr. Leslie Bumgardner "Helping People Get Serious About God." Ray Tetz, "Marketing Your Ministry." Sabbath afternoon workshops on Vacation Bible School, Helping Your Church to Respond to Local Disasters, Reaching High-school Students, and Friendship Evangelism. Call 740-397-4665 x165 for more information. Andrews University Music & Worship Conference. Mar 24, 2011 - Mar 26, 2011, Andrews University, 100 US 31 Highway, Berrien Springs, MI 49104. The eighth annual Andrews University Music and Worship Conference. If you're interested in exploring worship and worship music in ways that are theologically profound, practical, and inspiring, you will definitely want to join us. Sponsored by the NAD Church Resource Center and Andrews University's Department of Music, Department of Christian Ministry and Center for Youth Evangelism. Phone: 800-968-8428 x4 or 269-471-8352. For more information, email: worshipconference@andrews.edu. Parents, Educators, Supervisors, & Ministry Leaders Invited to Attend IGNITION. Discover key principles for working and ministering with today's young adults at IGNITION Summit, April 4-6, 2011, Dallas/Ft. Worth, TX. Dr. Tim Elmore, president of Growing Leaders, will be among the featured presenters. To register and for more information, follow www.IGNITIONblog.wordpress.com.